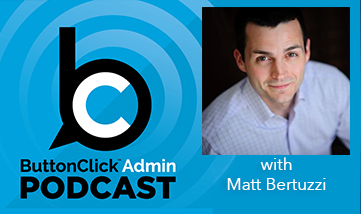 This week on the ButtonClick Admin podcast we welcome Glenn Weinstein, who is the Chief Technology Officer at Appirio. 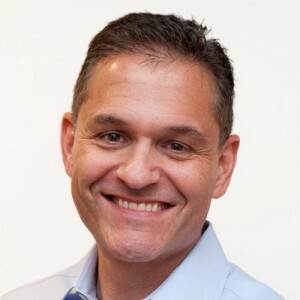 He is responsible for driving the technology vision for Appirio and building out the world-class systems and processes necessary to support Appirio’s rapid growth—all without owning a single server. 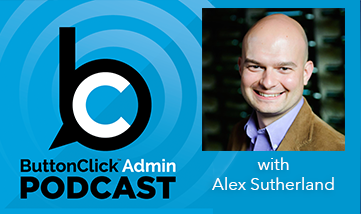 We start off by talking with him about his inspiration to start Appirio. Then we dive deep into what the business IT should be in reference to his Computer World blog post “Where does the cloud end?”. Glenn shares with us what the role for a CIO is in an organization moving forward now that cloud is widely accepted solution. 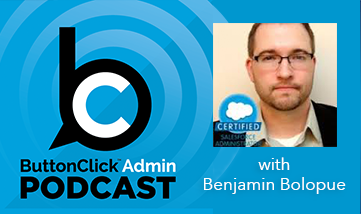 Finally, Glenn shares with us how Appirio manages Salesforce and improve their company with a Centers of Excellence program. Mike: And I know one person that will be at Dreamforce this year, so that $100 off gets you there faster, is our next guest who is Glenn Weinstein, who is the Chief Technology Officer at Appirio. Glenn is responsible for driving the technology vision for Appirio and building out the world class systems and processes necessary to support Appirio’s rapid growth, all without a single server. As the co-founder, he played a critical role in establishing the company’s consulting services practice before establishing the Appirio way delivery methodology as well as the Centers of Excellence Program. So welcome to the ButtonClick Admin Podcast Glenn. Glenn: Thank you very much Mike. Thanks for having me. Mike: So let’s get started by asking the million dollar question which is what inspired you to start Appirio? Glenn: Well, it wasn’t just me, of course. There were four co-founders at Appirio, but I can tell you my personal motivation, which was driven by being a user of on premise Software. I have a technical background. I’m a Computer Science major and I entered the professional world after getting out of the Navy as a software consultant, and I eventually became the VP of Global Tech Support for two public software companies. First for webMethods and then second for Borland. And at webMethods, I was the business owner of the CRM system and at Borland, I was the business owner of Clarify, and those were the systems my tech support team used to manage case flow, manage customer data, and so forth. And so as a software guy, I was always acutely interested in how our own software worked, and I found myself very frustrated. I didn’t know why I was frustrated at the time, but I was frustrated with on premise CRM generally, the lack of flexibility and the lack of agility in making changes to the systems and the challenges that our IT Department had in supporting those systems for us. When Salesforce came onto my radar screen back in 2005, it was when Borland adopted Salesforce as a sales automation solution; my eyes were opened first as a computer science guy, a software guy, to say, “Wow, this is different. This multi-tenant hosted model is significantly different architecturally from what I’m used to. And it’s a really good idea intellectually, and I liked it. And then I saw what our sales team was doing, the kind of flexibility they were enjoying and my support team was not enjoying as we state on Clarify, and I came to realize I’m on the wrong side of history here. I’ve got to get on the right side of software history and get on the multi-tenant hosted side what we now call The Cloud computing side of history. That was my motivation. My fellow founders had similar epiphanies at their companies, include ASP. And we all sort of within the space of a couple of months decided, “All right, that’s it. We’re betting our careers on this, and we’re going to go and start a company dedicated to expanding public cloud computing. Mike: I like that term, “Right side of history.” I’m going to have to use that in the future. So a lot of this, and definitely, plays a role in it, I’ll add the link to this blog post in the show notes, but you wrote for Computer World an article called, “Where Does the Cloud End” and you say that IT should be in the laptop/desktop distribution business. So in the right side of history, what does IT do? What is their business? Glenn: Well, I remember writing that blog. It was around the time of excitement that Google was launching the Chrome book, and I wrote that blog with the Chrome book in mind, thinking that ideally IT generally and CIO specifically want to be business advisors. If you read CIO magazines, including CIO Magazine itself, the highest ambition of a CIO is to have a seat at the leadership table to be seen as a business partner. Nobody talks in those magazines about their expertise around running servers or replacing hardware or running networks. They talk about their ability to enhance their business, make their business more productive, find new sources of revenue, and so forth. So to me the highest objective of IT is to serve as a business analyst who can translate business requirements into technology, figure out how to get the most out of technology to serve some business partner. So when I wrote that blog, “Where Does the Cloud End,” my mind at that point was thinking beyond the Cloud computing revolution, what happens when we get IT not only out of the business of maintaining servers and maintaining server- side software, but maybe get them out of the hardware business altogether. What would it look like if IT didn’t own laptops or desktops either? The same dynamic that makes Cloud Computing so powerful from a server point of view, is the idea that IT doesn’t focus on patching, operating system compatibility, and all the things that drag down traditional legacy systems. Get that same dynamic going on the desktop side. IT Departments that I’ve dealt with, including our customers, today still spend a lot of energy worrying about client side operating system, client side virus protection, client side software compatibility issues. Even, I hate to say it, even we at Appirio deals with desktop issues a fair amount and we try to outsource our issues to the Apple Genius Bar and to Dell Premier support, but heck, I’d like to get my own IT Department out of the laptop support business. So the idea of a Chrome Book or the idea of any kind of network is the computer kind of a solution is to keep pushing that boundary. Keep pushing outsourcing the commoditize part of IT so we can all be business analysts. Now, it’s two years into the Chrome Book, and I’ll be the first to admit that that revolution has not taken place yet, but I truly believe that is the direction that IT is headed in is to get IT not only out of the server business but also out of the desktop and laptop business. Jared: And so for the companies that you’re currently working with, have you seen that IT just stop being innovative with that or is it something that they’ve been holding onto what they’ve known. Glenn: Well Jared, I think it’s a little of both. We would definitely encounter a little of that resistance of, “Hey, I’m going to do what I’m good at” and even unconsciously, “I’m going to protect my turf even if I’m not going to admit that’s what’s happening.” But I think more that that I really believe that IT today traditional IT companies enlarge are trapped. They’re supporting a burden of support that they’ve inherited over many years that is hard to get out of overnight. If you’ve got a deployment of 10,000 Windows desktops, you can’t just change that tomorrow. And IT people, maybe more than anything else, realize that it’s very easy to make rash statements. It’s a whole other thing to live up to those commitments, and I think overtime, IT people get conservative of what they commit to but they know the cost and the challenge of living up long term to those commitments. So, you’re sitting on this legacy of laptops and servers and so forth, you just get gun shy. Sometimes it takes an Appirio to come in and make bold statements, make some brash statements, get people excited about a new vision and get your company on a different path. Mike: So you mentioned in your previous answer about the CIO really wanting a seat at the table and in an organization that’s moving towards The Cloud as a widely accepted solution, what are some of the challenges that a CIO is having to deal with in terms of anything that keeps that seat at the table? Glenn: Well, to keep that seat at the table, you’ve got to change your breakdown of spend. Gardner and the other analyst firms will tell you that typical IT Departments spend 63, 65, 66 percent of IT dollars on what they call run. If you breakdown all IT activities, build run, and transform. Sixty-five percent of run, keep the lights on, keep monitoring systems, keep patching systems, maintain 24/7 support, and maybe the lucky thirty-five percent left over for building new capabilities and transforming the business with net new type of business processes. If that’s where you sit, if you sit on the 65/35 split, as a CIO, you just don’t have a lot of time and resources to focus on your business. You, by definition, start to narrow your pipeline of new work, new applications, new business processes that you are willing to take a look out in any given quarter so the first order of business is to set yourself on a roadmap long term, where you’re starting to invert that ratio. Now if Appirio is a 100 percent Cloud Company. We don’t own any servers and my internal analysis shows we have just about flipped that ratio where we spend maybe 30, 35 percent of IT spend on keeping the lights on, that is paying for our Cloud licenses and so forth, about 65 percent on headcount, on business analysis, on new projects, on innovation. So if you can make that change in your spend then you can do what you want to do. And you get to do what people kind of inspect you to do. As a CIO, if you can live up to that, you’ll fit naturally into that role. If you go too long and you’re seen as that data care taker, you start to get a persona about you and it’s hard to break that impression. Jared: And we heard that some of that talk with disruption from Narinder, who we were lucky enough to have on our second podcast, so he was talking about disruption and how Cloud has disrupted business and even the CIO, but let me ask this, what hasn’t Cloud disrupted enough? Glenn: So you had my co-founder Narinder saying, well I can’t live up to his level of pizzazz, but I’m trying so I’ll see if I can give a snappy answer to that one. I think we, as an industry, certainly the folks around at Appirio, we sit around and having our drink at the end of the day, we’re waiting for more startups to take on ambitious markets like Salesforce did with CRM and now moving into lateral spaces. We see Work Day having the grand vision of becoming human capital management and also a financial solution in The Cloud. We want to see more of those. We want to see Cloud Companies that take on entrenched interest SAP and Oracle applications now hold a death grip on. Anything in the manufacturing space, anything more in financial controls and other kinds of applications that don’t fit neatly on the Salesforce stack or the Work Day stack through Google’s collaboration suite. I’m sort of surprised that we are still here in 2013 and on the manufacturing floor you don’t see a really legitimate competitive SAP yet. You know if I wasn’t so busy doing Appirio, I think I’d go start up a SAP competitor and try to do to them what Marc Benioff has done to Siebel and the other CRMs. So we haven’t seen that disruption yet. I tell you in almost every other area, we are seeing that disruption and it does go beyond CRM Collaboration and HCM. The most amazing thing that I see in our world besides all of that is what’s happening at the infrastructure layer. What Amazon Web Services has done to the plight of the poor data center expert is just phenomenal. They’re as innovative, if not more than all of the other Cloud players at the infrastructure level, and we’re finally starting to see competitors now at AWS. The big guys are getting in and trying to catch up. The AWS is so innovative. They push the envelope so hard. They are going to be touch to catch up with. So that’s what we would like to see. We want to see, as Mark Andressen said, “Software is eating the world.” We want to see Cloud eat the software world. It hadn’t happened yet, but we’re getting close. Mike: I don’t know. It depends on the day in Iowa The Cloud is looking like it’s eating everything. So this goodwill high level talk, I kind of want to bring the next question down to the average admin who listens to the podcast and again, reference back to another blog post that you had called “The Power of Habits,” but, and I’ve dealt with other companies and obviously in my changing roles, and I’ve seen it with other clients as well, where there is kind of this mob based mentality of everybody has to have a seat at the table in order to implement this Cloud thing. So how do Admins or Developers who are really looking to having an impact on their company move Salesforce through without having to deal with this mob-based mentality? Glenn: Well, I hate to say it but I’ve come to believe that at Appirio you really do need top down sponsorship. You need executive sponsorship to make a change and remember Appirio we’re mostly dealing with larger companies, with entrenched bureaucracies and quite frankly, I think it’s hard for an individual developer at a large company to make that kind of change without an executive sponsor. So the first thing I would do if I was a developer and I saw power of Salesforce and my company wasn’t moving quickly enough to take advantage of that would be to identify and really develop a relationship with an internal executive sponsor. You’ve got to get somebody, a VP or higher level, that gets what you are trying to say and sometimes that takes some convincing and an outside vendor like Salesforce or even Appirio with a little bit more of maybe an objective viewpoint, it’s hard for any outsider to make the first couple of strikes in that battle so I would start working internally on my executives. You’ve got the power, particularly with Cloud platforms, of showing, you don’t just have to tell, you can show. So get yourself a developer position or build some cool functionality on your nights and weekends and come in and show the CIO or VP of App Dev. what you built in your spare time and how it looks better than what you are running internally and how it’s faster and how users are going to be more inclined to use it and try to get some internal advocacy going. Glenn: I would rephrase that a little bit because we don’t do Cloud. It’s kind of a self perpetuating defeatist mentality. Now it has been a long time since 2011 in our world, and if you look at the universe of CIO or the universe of Enterprise IT, as a glacier, which I’ve come to look at it as, you know it doesn’t change overnight. But are we seeing a trend? Absolutely with more and more new CIOs, more and more new executives generally, not just CIOs, coming into companies saying, “I’m going to challenge any proposal that I see or any notion that I see that requires us to increase our investment in servers, increase our investment in on premise software. You know what we have come to call the Cloud Force mentality in CIO. You see more and more new entrance in those positions taking a Cloud Force mentality. I think it was helped immensely by Vivek Kundra, the CIO of the United States. He came in under the Obama Administration and made that a federal policy. That had a huge impact. It made it okay for commercial CIOs to say I have a Cloud Force policy. We’re not there yet. If we’ve gone from three to five percent market share in 2011, I don’t know where we are now, eight or ten percent maybe. There’s still huge swath of corporate America in the corporate world that need to discover what we are talking about here. But we are definitely moving in the right direction. I still feel like we’re in the first inning though for sure. Jared: That’s really interesting to hear. Going on with the question about Admins and Developers and ideas we take back, you’re going to these other companies, these large enterprise companies and getting them on Cloud and changing the way they do business. How do you guys at Appirio use Salesforce? I think that’s the most interesting thing. You guys are such experts in the field. How do you guys manage your own Salesforce? Glenn: Well, I tell you Jared, as our CIO, it’s a challenge to be the owner of a system that you’ve got 600 experts on. Sometimes I wish it was a non-technical company. We got a big fan base here. I think it’s great. One thing about Imperial in all respects, we practice what we preach. We are a big Salesforce consulting company and we use the heck out of Salesforce. I think we get more value out of our licenses than any other company. We consult on Work Day and we use Work Day for human capital and for our financials. We use the Google Suite for every aspect of the corporation, and we think it’s important to do that. We try to be rapid adopters of features, of new modules from Salesforce. We want our consultants to experience it from day-to-day before we try to help customers to get the most out of their sales experience. Now a couple of things about how we run Imperial I would love to share, first of all, we try to take on the same agile development methodology and the same iterative delivery approach that we advocate for customers. Customers coming off of imperative software are used to long slow releases that are very large. And users learn over time that if they don’t get all of their requests in during the requirement phase, there may not be another requirement phase for a couple of years. And when you move to Cloud and you move to agile methodology, you’ve got to convince people and develop some credibility that say, “don’t worry about it. We are going to get this released out and it’s going to be a small release. And we are going to be constantly seeking more and more requirements and we are going to be reiterating and improving the system. That’s as true at Imperial as it is at any other company. We don’t make changes on the fly, we all know the dangers to ButtonClick admins when you start to change page layouts so we don’t that. You have to have regular releases and we try to keep that mentality up at Appirio. The other thing that I want to throw out there is we have a lot of developers at Appirio. A lot of people that like to write code, understand Apex and Visual Force, and want to show their stuff off, but we as a company, we believe very strongly in the power of reconfiguration. And the best developers try to write as little code as possible. And furthermore I say that they should try to write code that enhances configuration in the future. And I’ll give you two specific examples of that: We have something called the Presales Request, custom object in our Salesforce org. and a pretty complicated round robin routed mechanisms. You know it’s nothing that quite fits an epic change package or anything. We had to write a custom module for that, but the way we wrote takes maximum advantage of customer settings and other configuration capabilities so that in the future admins can maintain those queues and change routing rules without ever touching a line code. That takes more effort upfront when you write the code but it has a huge long term maintenance write off, and we’re willing to make that investment. And I hope every shop will make that investment. Write a little code upfront to reduce the amount of code you have to write later. Mike: I know that as I dove deeper into the Salesforce custom setting is something I’m just learning about and they’re pretty cool. I’ve been able to leverage them quite a bit. Glenn: And I would categorize them. You might go to the general banner of config because admins can change them without needing any particular expertise in coding, and if you are careful about it, if you write good code, you can let your admin make huge changes in the behavior of your app just by tweaking your custom setting. b Well you know if I’m in there digging around, it’s got to be ButtonClick friendly. If I see code, I just hit the back button. Glenn: Even developers, they want to have simple configs. Jared: Well I think you see that a lot too right now. It’s very important, because it used to be a lot of times, businesses had to step outside the platform or the program they were using when they changed. Now giving the admins the ability to do that, now their program, their platform, their process is dictating the changes. Glenn: I think that’s a great thing, and we try to keep people in the inside the force.com platform whenever we can. I’m very thoroughly convinced of its power as a platform service offering. And I hope that one would take away from this discussion is that it’s not just for developers. Using the platform intelligently enhances your config capability. Mike: Now one of the things, and this would be probably the only non- Salesforce question we ask, but it’s because it’s so interesting. You know you mentioned how your agile process at Appirio was to constantly improve your Salesforce implementation. I think another program that you guys do that is interesting, and I want to prod you to talk a little bit about is something called your Centers of Excellence program. So can you kind of explain what that is and then how your company benefited from it? When we started to grow past the point where every individual consultant wasn’t involved in every project that we did. We wanted to find a way to share that experience so that if you are here at Appirio and we worked on customer acts, even if you never touched customer acts, we wanted you to feel like you got the benefit of experience of the fact that Appirio touched the customer act. And we learned some hard lessons and we found some new ways of doing this so the Center of Excellence, the ultimate objective was to get that sense of shared experience. So today it takes the form of groups within Appirio that have a share interest and we got specific definitions around a sales cloud center of excellence, a service cloud, marketing cloud, integration and all the major topics. Consultants don’t generally belong to a lot of them, they belong to one or two Centers of Excellence generally, because we want people to go deep and narrow when possible in these areas. And the whole purpose is to share experiences on a regular basis with what you are doing with your customer with that end objective in mind. Let the other consultants feel what it’s like to be in your chair. Know the story so that if six months from now a customer has a similar issue, you can say, “Oh, when we were with customer X, we did it this way,” even if you never touched customer X. So we get a lot of vendors coming in. They tell us about their offering if we use them at a customer. We got a lot of consultants sharing experiences. We have huge [wikis] built on Google sites around each Center of Excellence, and it’s everything from sharing code to sharing stories to coming up with new templates and bits and pieces of methodology. Jared: And sitting in your role as the CTO at Appirio, we’ve heard a lot on the podcast about Chatter. Talking to somebody in the C Suite, what are some tips you can give other people listening, other C Suite listeners on how to best use Chatter? Glenn: Well, we feel like we’ve been very successful in terms of adopting Chatter. We were right there in the beginning. We were one of the first very customers to use it, and I think there are two things that made Appirio successful, just talking strictly internally on our use of Chatter. One is that we did what Marc Benioff said what not to do, which was we made it Facebook for the enterprise. I don’t know if you remember at Dreamforce, they said, “Don’t do that. It’s not Facebook for the Enterprise.” You know, it kind of is. So every morning you get to coming in and see what your colleagues have done. And people just love sharing. We created this culture where you want to brag. You want to tell people, “Hey, last night here is a picture from the dinner we had with the ACT team, and here’s a picture of Mike Gerholdt. You know that’s the sort of thing people Chatter about. And so it has become exactly like Facebook for the Enterprise, where I keep up with my friends at Appirio who I don’t get to see every day. The second thing which I think is even more important is that we have taken full on the strength of Chatter where it’s in context. It’s amazing to me that a lot of customers overlook this basic thing, but chattering on an opportunity, on a user’s story, on a support case, on a contact, and we got a ton of customers chattering on those objects. And moving out of e-mail and moving conversations into the context where they belong has a transformative effect on corporate culture. And if you see something on an opportunity that kind of strikes your fancy or if you can help, well, there it is. The conversation is right in front of you. It gets us out of the mindset of secret conversations in the hallway. You know, “How are things really happening in management?” Well, you don’t have a lot of that at Appirio because it’s all right there in the org. and anybody can see it. Mike: Including the dinner pictures with me. Glenn: Those are very popular. Now what I just described, that takes executive sponsorship. You can’t come into an individual [data] and say, “This is how we are going to start using chatter.” You have to have it from the CEO down. Some commitments to that sense of openness, but if you do have that commitment, that’s a great way to put it in practice. Mike: You know we like to, as we wind down, this great episode and you probably heard it a hundred times before. I know Glenn, your definitely one of the guests that we can do a two or three hour podcast on so we’d like to have you back around Dreamforce and do an extended edition. One of the ways we like to end asking every guest about is there favorite Dreamforce memory and having been involved with Salesforce for as long as you have, I’m sure you have quite a few and probably a few different experiences than some others. Can you elaborate on that? Glenn: That’s hard. I’ve been to seven Dreamforces now dating back to 2006. So Appirio, of course, we always sponsor Dreamforce in a big way. It’s always been major event for us. Can I give you two? Mike: Sure. There’s no hard and fast rule. Glenn: Neither one is like super exciting but I have good memories. One of them was at the very first Appirio all hands in the company meeting. We held at Dreamforce in 2007 and it was the first time that all 16 of us had met in person. And I remember we had a little conference room in the bowels of Moscone. There were like 12 chairs in there and a bunch of brooms and stuff and we held our first All-Hands meeting and we took a lot of pictures that day. I still think back to that. Appirio is very big right now compared to that day but that to me is a great memory. I still smile when I think about that. And the second is we got involved in the Salesforce Education Services program pretty early on, and I was one of the first instructors that taught the developing courses. I actually taught the 501 course when it was first being developed. I forgot the original name of it. It wasn’t 501, but I got to teach one of those courses at Dreamforce and by far it was the biggest audience that I ever taught a technical course to and it was in Moscone and they had all of the computers lined up and that was fun. For me to go to conference, yeah there’s a party, there’s the meeting people, there’s the seminars, but to really feel like you contributed, I felt like I taught a bunch of people something new about the power of Salesforce. That was extremely exciting for me and the best and most fun I ever had teaching in a class. I don’t do that anymore but one of these days I’m going to teach another class at Dreamforce. Mike: I agree. I love being up in front of people and especially if you can do it as an instructor, seeing their faces light up or seeing that light bulb. Exactly. You can see when somebody gets it and really takes hold of it so. Mike: That’s great. Well Glenn, thanks for being on the podcast. I think this was very informative and I know we had a ton of questions for you, but you answered them and got through them and gave us some really good advice. Mike: If people wanted to follow you on Twitter, what’s your Twitter handle? Glenn: That’s super easy. It’s @glenn, that’s G-L-E-N-N-W-E-I-N-S-T-E- I-N.